Did any version of the Enterbrain-made, Degica-published RPG Maker MV actually earn a physical release somewhere in the world? I ask because although I'm assuming this latest entry in the decades-old make-your-own-RPG series is available in boxed form in Japan based on the following image, I can't find any evidence to support that assumption. Regardless, the concoction on the right, which was noted in this NeoGAF thread as being the Japanese PC version's official box art, is pretty spectacular, if my opinion. Granted, it's from the same, boring "cram a bunch of the game's characters into an amorphous blob" mold that produces too many of Japan's cover images these days, if you ask me, but its colors are so nice and it's so pretty overall that I'm willing to give this example a pass. Have any of you played any iteration of RPG Maker since the first debuted 22 years ago? I'm sad to say I haven't, but I'd love to hear from someone who has--especially if that person can help me figure out which version (if any) would be worth picking up in 2015 or 2016. 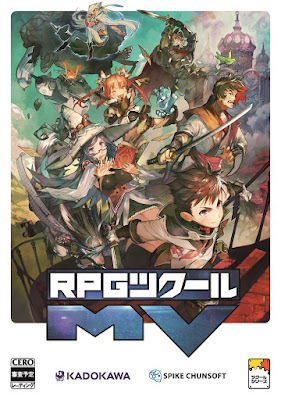 Oh, and if you're curious to learn more about RPG Maker MV, which was released on Oct. 23 carrying an $80 price tag, check out its official site at rpgmakerweb.com.